The Easter Blessings Cross is cut out in our workshop. 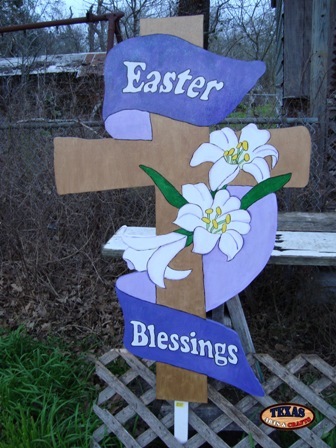 The Easter Cross is hand painted brown with white lilies painted on the center. The ribbon is hand painted purple and it reads Easter Blessings. The dimensions for the cross are approximately 46 inches tall by 29 inches wide by 2 inches deep. The sign is a local item only, and should be picked up from our shop or from a craft show.